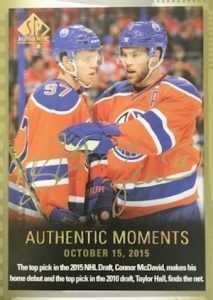 A modern dynasty for NHL collectors, 2015-16 SP Authentic Hockey is back for another look at the league. Hobby boxes include three autographs and multiple inserts. The base set includes 100 veteran players with a Limited parallel that is numbered to 25. There are also Limited Autograph parallels in the form of Tier 1 (#/99) and Tier 2 (#/25). In addition to the familiar base set, several popular subsets offer additional collecting options. This includes SP Legends (1:5 packs) and Future Watch (#/999). 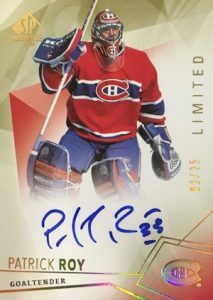 Particularly intriguing to collectors due to a rookie class with standouts like Connor McDavid, Jack Eichel, Dylan Larkin and Artemi Panarin, the Future Watch cards are again found in both base and autographed versions. Collectors will find one Autographed Future Watch Rookie (#/999 or less) in every hobby box. There is also a Inscription Variation that is numbered #/50. 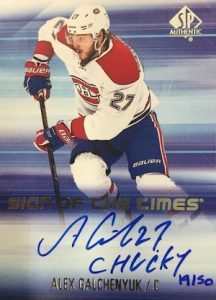 Adding to the hit totals are a variety of new signed options, including Global Chirography (1:180 packs), Great White North (1:240 packs) and Scripted Stoppers (1:480 packs). On-card autograph patch cards average two per case and largely parallel the base and Future Watch sets with limited options like Veteran Limited Auto Patch (#/100 or less) and Future Watch Limited Auto Patch (#/100). 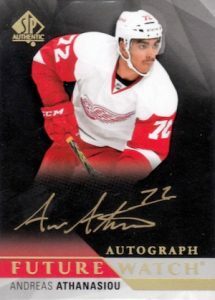 Long a staple of SP Authentic, Sign of the Times (Tier 1 - 1:60, Tier 2 1:140) also offers Rookies, numbered to 299, 199 or 99, and multi-player options, including Duals (#/25), Trios (#/15), Quads (#/10), Sixes (#/6) and Eights (#/5). Both the base and rookies options feature limited Inscriptions Variation with varied numbering. 96-96 Retro (1:10 packs) rely on past designs and are joined by 96-96 Retro Legends (1:60 packs) and 95-96 Retro Premier Prospects (1:12 packs) and 96-96 Retro Legends (1:60 packs). Each insert also offers a rare Gold Autograph parallel. Highlighting all-time greats, Franchise Icons (#/199) are the rarest base insert option. 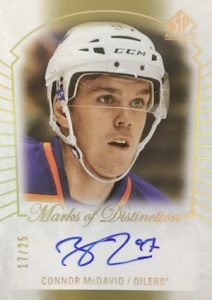 Marks of Distinction Gold Spectrum inserts are autographed and numbered to 25 copies. Also signed, Immortal Inks feature a print run of just ten. Authentic Moments and All-Time Moments document notable events and each fall 1:13 packs. Offering several players, Multi-Player Authentic Moments and Multi-Player All-Time Moments average 1:50 packs. Limited signed versions are also found but they are tough pulls. 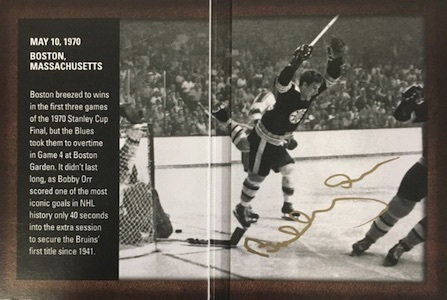 New to the release, Authentic Moments Autographed Booklets (1:1,000 packs) and Authentic Moments Dual Autographed Booklets (1:5,000 packs) feature a fold-out design and large signing area. Presenting new subjects for sets from earlier in the year, UD Update (1:6 packs) and Young Gun Update (1:25 packs) inserts can each also be found in Exclusive (#/100) and High Gloss (#/10) parallels. 190 cards. Shop for complete base sets on eBay. 39 cards. Specific group odds noted below. 12 cards. Specific group odds noted below. 11 cards. Specific group odds noted below. Unannounced. Appears to cover entire Series 2 Young Guns checklist (#451-500) but most feature different images. Interesting look for the Sign of the Times set this year … very colorful!! Hopefully, the SOTT is not going to be only focused on the rookies, but also include some veteran autos. Do we know if the Mark of Distinctions and Immortal Inks autograph subset are going to be back ? Philmarois76 � SOTT includes rookies and veterans. Both Mark of Distinctions and Immortal Inks are back. Always love this product and yes Scott I even like the Retros. Remember this product went way up in price. 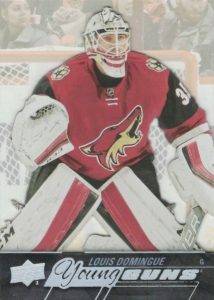 If you have any issues with cards from Upper Deck send an email to qa@upperdeck.com. You will also need a receipt and upc code. does anybody know when the set checklist is going to come out? I’m very excited about this release – probably more than any other UD set this season…mostly in part because of it’s a decent price point in comparison to the nutty other releases and SPA has always been good at retaining and/or growing in value. Please don’t crush my excitement when the checklist comes out…lol…the veterans/alumni they have chosen lately are really bizarre. Looks like a nice product but I don’t get why they throw the Matt Murray YG card in here instead of waiting until next year’s UD series 1 release. According to the odds it’s basically a case hit…for a regular YG card. Good luck affording this card! @Larry why do you see the odds showing it as a case hit? There are 4 young guns or update cards in every box. my only real point is that the young guns are fairly plentiful and it’s not especially hard to get your hands on them. Scott… It says YG are 1:25 so you basically get one per box and 10–12 per case. Since there are 10 YG cards you’ll be lucky to get one Murray YG per case. And yes I’ll wait until the price is unreasonable. Tarasenko….. is he totally out from this product ??? Always look forward to SPA. However, I don’t like retro cards. Seems Domi is missing in several issues. He’s not in FW Inscribed, Auto Patch or Retro Gold. FW Inscribed also missing McDavid, Panarin & Bennett. Murray only has FW Base but no auto? Why? Please UD, why is Plett in All-time & Legends? God awful upper deck and their elitist nonsense. They purposely rig the card distribution so the fat canadians get the high end cards. seriously, keep feeding the bears. stephen muschiano � Every collector has the right to their own opinion but no need to throw insults into the mix. I’d rather not have to start editing/deleting comments. Order boxes from canada then ! Fat Canadians? Wherever you are from I can almost guarantee that your state is more obese than any province in canada. Also…. whatever your favorite team is there’s a good chance that the MVP on that team is canadian also ….. A big reason why you are interested in this set is probably because of canadian Connor mcdavid. Fat Canadian here. Cracked a box. Got a terrible return. Low end FW auto (Kenins), B rated sign of the times (Moulson) and a 14-15 SPA Marks of Destinction of Pacioretty. An unautographed FW card of some ‘cane not named Hanifin. YG update was some Columbus goalie we’ll likely never see again. I know McDavid is the ultimate prize but this box left me feeling empty and not very hungry for more. I gave it 3 stars overall which frankly is generous. I agree with Scott. The design is very nice. The Global Chirography cards with the flag on the background are absolutely superb. The checklist is ok I guess. The autos are on hard, which is pretty rare nowadays and they employed pens that use an ink that we can actually see, contrary to Trilogy for example. What I dislike are the tons of updates. First of all, this product looks like a garbage dump. Hey, what we couldn’t sell in the past years, let’s drop it in this collection. Let’s take advantage of the very good rookie crop and throw in some Ty Rattie and James Neal auto from 2013. Also, in my understanding, we use updates when players change the team during the season (e.g. Seth Jones from Nashville to Columbus). But what’s the point of an update when the player didn’t change the team?? Why in the world make update cards for Namestnikov and Granlund. They’ve always played with the Bolts, respectively the Wild. On the other hand, Jiri Hudler and Shane Prince are two examples that could have used an update card. They were both traded 4 months ago. I’m sure there was enough time to make cards with their actual team. But, to be fair, I like the Young Guns update. Another issue with this product is the 999 serial number for the rookies. Basically, the cards hold no value. I mean, come on? 1000 copies of each??!! What’s the point of even serial numbering them? 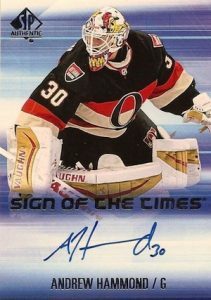 At least the autos should have been numbered on 199 or something similar. 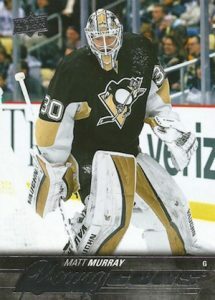 I like the fact that there are a lot of auto sets, but I would have loved to see one or two less and replace them instead with patch/jersey sets. I would give 3.25/5 for the product. Not one of the best, definitely not one of the worst. Also, I don’t believe a second that Canadians receive better boxes. It makes no sense. 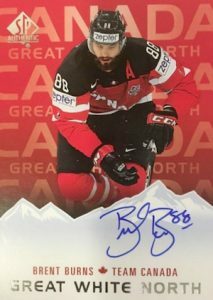 I guess we simply buy much more hockey products in Canada and that’s why people are under the impression that Canadians have better pulls. Great product! I have opended 3 boxes so far and I have gotten some good pulls. 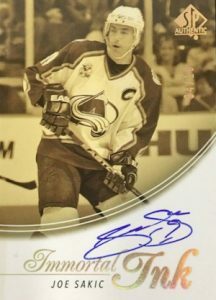 Tomas Tatar 95-96 retro gold auto, Dominic Haseck scripted stoppers, Mark Scheifele and Tomas Tatar sign of the times autos, Vertanen and Parayko sign of the time autos, 4 future watch autos, several future watch, Authentic moments multi and a few All-time moments multi, plus completing the base set(100). Not bad so far. 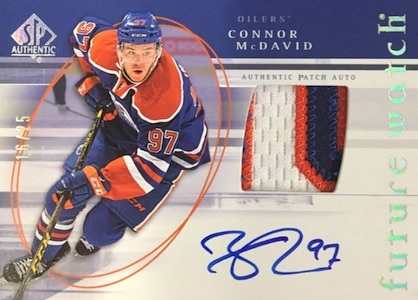 Where I purchase my boxes someone pulled a Mcdavid future watch patch out of #100. I will definitely be going back for more boxes! UD responded with a tweet to me that it’s all random, but I’m Sorry I’m following all the blogs tweets and Facebook posts and it seems that 90% of the big hits are all out of Canada. I will agree that most of the product is bought in Canada but there is still enough US buyers that there should be more big hits than there are. You shouldn’t open half a case and Fabbri is your best Auto. Heck I opened just 2 boxes of 2016 Donruss ELITE that just released and hit not only a Pen Pals Triple Auto but a Strahan Auto to 10. These authentic boxes can be tracked and until I see evidence if the proportionate amount of big hits here in the US I’ll still say Canada is getting the better boxes. I wouldn’t say a definitive no to the idea, but frankly, you guys have not the slightest proof of that. I’m not even talking about that Josh B who clearly posted here just to insult people. I’m talking about normal guys who just give an opinion. That fact that you believe that 90% of the big hits are from Canada has almost no proving value. I’m not trying to be condescended, but that’s just an impression you have. Sure, it may be true, but you don’t have numbers to support it. Here are some numbers. While, they are not extremely eloquent, they are based on solid facts at least. I went on eBay and searched all the main listing, on buy it now, with hits from SP Authentic 2015-16 for McDavid, Domi, Eichel, Panarin, and Larkin. I’ll not detail the results for every one of them. Globally, out of 77 cards listed, 26 are from the USA and the reste, 51 from Canada. That means that roughly 35% are from the USA. In other words, in average for every hit pulled by an USA seller, there are a bit less than 2 hits pulled by a Canadian seller. Sure, as I said, these numbers are not eloquent enough. Someone should conduct a large scale investigation in a much more professional manner, but they give an idea I guess. Anyhow, they are very far from you 90% of Canadian hits, because that would mean that for every hit pulled by an USA customer there are other 9 pulled by a Canadian, which is highly improbable. Even if UD wanted and did the thing you’re accusing them of, I think they would keep the numbers lower than that. The numbers I collected from eBay seem right. But, without knowing actually how many cases were sold and opened in Canada and how many in the USA, the numbers I provided don’t mean much either. Also, I’m just curious how would they keep a record of all the hits in the cases? How would they decide who gets them and why would they do that? Frankly I would rather keep happy and try to enlarge a potential pool of 320 million buyers, than one of 35 million, which represent the populations in the two countries. My guess is that the eBay numbers support my initial idea: Canadians are more interested in hockey than Americans. Thus they buy more boxes and implicitly they pull better hits. *Erratum – I didn’t searched for Eichel. Only for the other 4. Canada will not have a 50 goal scorer for the rest of your life. I appreciate the research but what your research won’t tell you is whether or not that seller has the card in hand or if you hit it in a break hosted by a Canadien Seller. The boxes come with a Barcode inside for QA, hits are hand fed, it’s how they can determine if a hit is missing from a claim. And if a hit is damaged out of Pack they can trace the handler. Maybe it’s not 90% but 65 to 70% is still an overwhelming majority. I’ve seen tweets from shops in Canada where a case was broken and hit 2 or more McDavid autos. It’s not just a matter of how much is opened or coincidence, of course UD would never admit it but one has to question at the very least. Interesting detail. I admit I wasn’t aware of that. All in all, the subject deserves definitely more investigations. I am in the USA. I bought one box and pulled Domi FW auto redemption, but it is numbered to 949, not 999. Also, to the dude who posted that the FW aren’t collectible at #999, this is a mid level product that has broad appeal to all collectors. Demand is higher because cost is more reasonable and you still get hard signed autos. Therefore, #999 isn’t as diluted as it might appear vs. #99 in The Cup, for example. In other words, the volume of collectors for SPA is higher than for The Cup. That must be a mistake. All the redemptions are numbered to 949, while in fact the actual cards are numbered to 999. As for the cards #/999 I maintain my opinion. Indeed they are hard signed and I said that’s a good thing but numbering a card on 999 makes no sense. That number should show collectors that there is a limited number of copies of that specific card, which should increase its value. When I say value, I don’t mean necessarily pecuniary value. In this case, knowing there are 1000 copies of a specific card doesn’t increase its value. It’s simply useless. Collectors would buy the Future Watch cards regardless they are numbered to 1000 or not numbered at all. That was my point. Yes, the cards are more affordable and that’s a good thing, but the cards could still maintain a good value if they reduced the serial number at least for the best rookies. Because, let’s be serious, someone who looks for economy products, will still not buy McDavid or Larkin in this set. 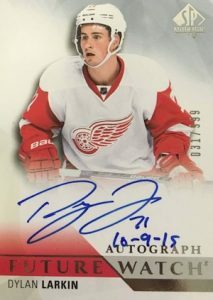 I have always liked the /999 Autos and even this year with Eichel being a /999 base. I think that this card could hold value as well due to his potential and lack of UD signature. 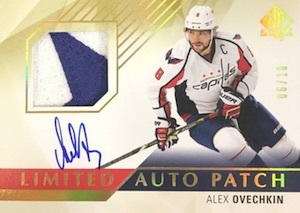 I like the /100 Limited patches as well, I could also do without all of the retros that seem to pop up in every single UD product. Overall, very nice product this year. Love how the guy complaining about the “fat Canadians getting the good cases”, posted the day before the product even came out. I am a big fat Canadian and have opened 6 boxes and guess what? I didn’t get a Mcdavid, Eichel, Larkin, Panarin or Domi, etc. And do you know what else? I have seen over a dozen cases open at my local shop and seen only 1 Mcdavid future watch. I guess UD sent my local store USA cases??? Also there is great value in autographed rookie cards numbered to 999 and that’s what makes SPA a product that collectors flock to open. If you check ebay, calculate how many Mcdavid Young Guns have sold or are listed. Likely 10 times as many so where is the value?? SPA or regular Upper Deck? Totally disappointed. After opening my first two boxes, about $160 each, the value of the cards AT BEST are $55-$70 in each box. Same with other UD products, they are not worth opening unless you get the rare hit. THESE ARE WAAAAAY OVERPRICED !! – Ticks me off. Smarten up Upper Deck, you are destroying the hobby. I collect mainly Future Watch Autos and LOVE to open boxes. But 1 FW Auto is not enough. There are great cards in the set, and SP Authentic is my favorite set, but I really feel I got ripped off. Boxes should cost about $85-$90. Opened about 1 1/2 cases and fairly disappointed with the distribution of hits. Way too many 14-15 autographs, I believe I have 9 in total out of 18 boxes. And they count as hits. Most of the big name guys that weren’t live at pack-out were redemptions. The rest just got held back and dumped into this as crap auto hits. Value for this year is extremely low, even with McDavid in the product. Watered down to increase the product run. As for the person asking about the redemption /949 and not /999, the first 50 of each future Watch is “scripted”. There are 949 of the non-scripted cards, but both will be numbered out of /999 (first 50 scripted). For me SPA is a great product. Improved in not only the design on sign of the times but better veteran players. The only thing I’m not impressed with is that I’m not a series 1 and 2 collector so these update cards are totally useless to me. The best was when they had the silver skates in 13-14 SPA. Hopefully they don’t put them in for next year set because I end up giving away my update cards or I leave the to the person at the store to give to someone who does or to a kid who is just starting. After reading all these posts about better hits being sent to canada it would be interesting to know how many cases were shipped to canada and how many stayed in USA. From what I can see by the checklist there are soooo many autos in this product the odds of pulling a half way decent one is next to non. If you want to show upperdeck how mad everybody is with all the crazy high print runs and in my option destroying the hobby. Do what I have done. I’ve stopped buying boxes and cases until they start listening to use the customers. The only way to get there attention is to hit them were it really hurts in the pocket book. Since 2007 I would say on average I spend between 15000 to 20000 on boxes and cases. I’m a collector not a seller. This year I’ve spent 1300 bucks and don’t plan to spend anymore. Way to disapointed with it all. Sp authentic is my second favorite set next to ice. I did buy 1 box and pulled 3 bad autos. If you stop buying there product and have them sit on thousands of cases in there ware house and they start losing money they will make changes if hope. They are taking advantage of mcdavid. And as a business point of view I don’t blame them. They are running a business and like any business they try to make as much money as possible. If we stop buying they might start listening to the customers. I’ve opened about 5 boxes. I’ve pulled a Larkin Auto redemption, but that’s about it. I bought 2 boxes out of the same case and got a duplicate SOTT Kevin Hayes. Just like with most UD products this year, it’s hard to get value unless you hit one of the big names. I’ve pulled more re-insert autos than I have pulled other autos. Not a huge fan of UD reseeding these cards, but it’s better than getting one less auto. On a separate note, it seems there’s a ton of the FW AU’s that are redemptions. This product is being release in summer…they’ve has ALL SEASON to get the cards signed. For one of their most popular products the idea of this many redemptions is unacceptable in my eyes. I’ve pulled 6 FW autos, 3 have been redemptions: Larkin, Subban & Skjei. Just don’t get it. I would like to validate one card listed in the Update checklist. It says that there are two distinct Sign of the Times SOT-SW Shea Weber – Nashville Predators 1:3,038 Auto for the 12-13 SPA set and also for the 11-12 SPA set. I have seen many from the 11-12 SPA release surface over EBay since the product release, but none for the 12-13 set! 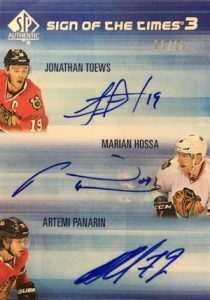 I’m actively collecting the SOTT set of 12-13 SPA, so I want to validate that this is not just a duplicate error while putting the checklist together! Thanks! Philmarois76 � It was a double-listing. The only SOTT for Weber is in 2011-12. Hey Trey, any update on the FWA black(good ink) cards? Odds? Players? Etc? JG � No word on the odds or print runs. While quite rare, looks like at least a few of each and they cover a majority of the base FWA. I updated the list. 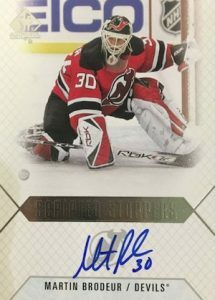 Trey, I can confirm 227 Zachary Fucale for the FW Black Auto. Just hit it this morning. LOL; Im feeling extra fat after reading the reviews; I opened 3 boxes and have 1 to g.
That being said, I have alot of friends who have opened cases and got less….. 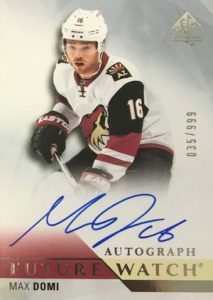 I don’t consider any FW auto a case hit, regardless of player since the probabilities of getting one are the same in Canada and the US, the only difference being what players card some random number generator packs into the box…..
Also, auto /999 is good when you consider the amount of production and popularity of the product… also there are fewer parallel autos of the same card/player making the good rookies hard to find and limited which is why you are creating false claims about Canada vs. USA distributions; your facts are as strong as CNN coverage of the elections…. The truth is Hillary is a bigger crook than UD and if elected will ensure hits come to Canada because she loves foreigners more then her won people!! Despite my LUCK and Prayers I agree with the product reviews, I’m giving it a generous 3, it is loaded with unwanted relics from the past and UD is dumping their inventory on good people paying lots of money for garbage. @Chuck M | Jul 7, 2016 – US is accepting political asylum applications daily. seems like your lacks of big hits is political prosecution since every other Canadian gets big hits in each and every box they open. Long live ‘big fat Canadians’ who are warm, fuzzy, bear dating Martians. I’m not sure what everyone is complaining about. I live in Minnesota. I have purchased several boxes of 2015 SPA and have hit the following: Dylan Larkin FW auto (redemption), Dylan Larkin FW black gold ink auto, 5 Matt Murray YG, Connor McDavid FW patch Auto #’d to 100, Matt Murray FW auto (redemption), 3 Connor McDavid YG’s, 2 Max Domo YG’s, 6 different inscription autos, and many many other FW autos and limited autos. I love the product. Yes even the retros! I was really excited for SPA this year. I even considered buying a case and tucking it away BUT after watching break after break after break, I won’t be purchasing anything other than maybe 1-2 boxes. Hey UD….holy toledo! IS IT POSSIBLE TO HAVE MORE REDEMPTIONS IN A PRODUCT? I started making a list of all the redemptions that I have seen during breaks and it’s silly. I bought a box for around $160 Cdn & after opening it I amazingly turned that $160 into about $35. What a magic trick!! UD..if you read this, make note. NO ONE WANTS SPA HITS to be the frickin update cards or garbage from previous years. At least I don’t. For what I pay for a box of this, I WANT 2015-2016 CARDS. 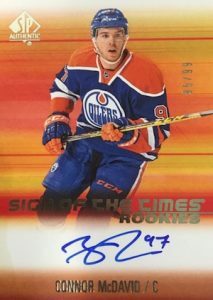 I think UD is lucky they signed McDavid to an exclusive b/c if they hadn’t I doubt he would have signed as many cards as he did throughout all the releases. The pricing on most UD products is out of sync don’t you think? I don’t think you’d have as much backlash from us collectors if SPA was around $100 Cdn/box. I could handle that risk/reward a lot better. I am going to compliment UD on 1 thing with SPA. With the box I bought, I didn’t receive a single base card double at all. I ended up 19 cards short of the 100 card base set so congrats on that UD. As a side note, I just watched a ton of Ultimate breaks and what a debacle. I’m sorry, Ultimate should be $125/box Cdn TOPS. I bought another box, against my better judgment, and I got another box of nothing. I don’t mind the Shore FW Auto /999, but the other autos are crap, just like my other boxes. We pay about $150-$160 before taxes here in Canada…cards value in box = about $30-$40. After busting a case I’m revising my rating to 3 stars. The background gives the impression that there’s a flaw in the top left corner. There’s so much filler. 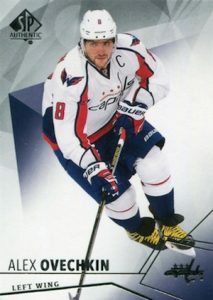 The base set is only 100 cards, yet UD put a Chelios (Det) & Roy (Mtl), but there was no Kucherov or Backstrom…WWT? Where can pricing and values of the sign of the times 6 and 8 be found? And 19 base sets ?? 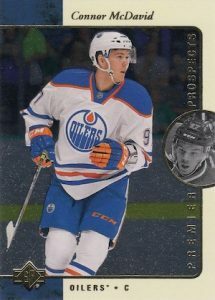 –I DID SEE AN MCDAVID ERROR CARD LAST YEAR DOES ANYONE KNOW WHAT THAT WOULD BE WORTH?